WSO2 recently published a new white paper on what WSO2 platform can offer for developers. The paper talks about all the elements of WSO2 middleware platform and how it can aid a developer to build & govern enterprise applications. The paper discusses about REST and SOAP service development with technologies like JAX-RS/WS and also using more of modern ways like jaggeryjs. The author have illustrated the plusses of each paradigm, when to use it and how to use it. The paper discusses how to write such services with support of WSO2 developer tooling, deploy them into WSO2 middleware and also manage them using WSO2 governance toolset. The paper takes a deep dive into technologies like Apache CXF use and JEE support within WSO2 platform and how to use these frameworks to develop applications. The paper also talks about API management which is a hot topic at present and how WSO2 API management solution can easily expose fully managed APIs for already created services. Use of cloud APIs via WSO2 integration platform (WSO2 ESB Cloud connectors) is highlighted in the paper giving the developers an insight on how to connect their applications to external APIs. The paper also talks about using the AppFactory; WSO2’s newest tool for application development, management, governance, team management. The above two gadgets are taken from WSO2 Cloud Gadget Server and have linked in to this blog, to convince about the great flexibility and reach it can add-up. You do not need to use the Cloud Gadget Portal as the only place for your data to be presented (Of cause if you are not using other gadget server specific privileges such as inter-gadget communication etc). You can simply use the Gadget Server as your own gadget repository, and encourage users to discover the gadgets and embed them into their own web pages over the web. Yesterday (1st of June), A little over a 12 developer team at WSO2, took a great middle-ware platform in to the cloud. 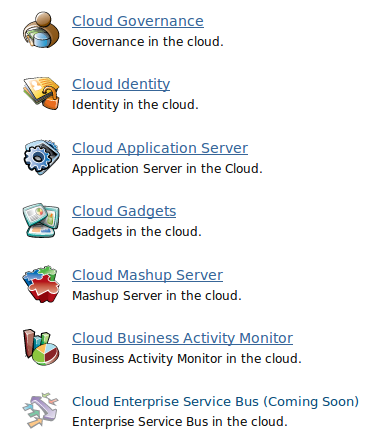 It’s not just putting all our server products on an EC2 instance, but embedding all cloud-native features into them. The PaaS (Platform as a Service) is named as WSO2 Stratos, which is based on award winning WSO2 Carbon middle-ware platform. As the Alpha-1 release, Stratos offers number of WSO2 products integrated, namely Governance Registry (GREG), Identity Server (IS), Business Activity Monitor (BAM), Mashup Server (MS) and WSO2 Gadget Server (GS). Stratos is also offered as a downloadable version for the private cloud within your enterprise. If you are quite serious about using SOA for your enterprise and do not need to worry about deployment, scalability and server maintenance, Stratos would be the ideal solution for you.